Apple’s AirPlay technology for streaming music (and video) to compatible devices first appeared back in September 2010. But, generally speaking, using AirPlay requires that you purchase compatible speaker systems, or Apple devices (like the AirPort Express) that can send AirPlay audio over a 1/8-inch (3.5mm) cable or S/PIDF optical output, which you can in turn connect to powered speakers. Griffin, claiming that “the good speakers miss you,” has announced a new device called Twenty, an amp that connects to your existing non-powered speakers and lets you stream AirPlay audio to them. 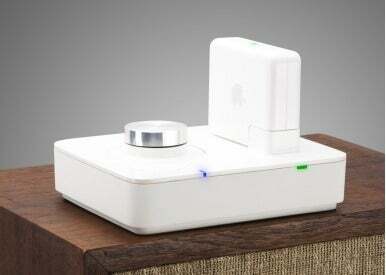 The Twenty does require that you snag one piece of Apple hardware—an AirPort Express base station. You plug the base station into the Twenty, connect the Twenty to your speakers, and rock out. The Twenty will ship with a Toslink cable to connect your AirPort’s optical port to the Twenty’s input, and a power passthrough port to juice the AirPort itself. The Twenty can also drive a powered subwoofer, making it one of the few devices compatible with both a base station and a bass station. Griffin says it offers 20 watts per channel. A large volume knob—reminiscent of Griffin’s PowerMate—sits atop the Twenty. Griffin hasn’t said yet when the Twenty will ship, or what it will cost, but you can sign up on Griffin’s website to be notified when the amplifier is available.